Is Your Community at Risk from Wildfire? To learn about various planning tools to make your community more prepared for wildfire, join the Community Planning Assistance for Wildfire Training on September 12, 2017 at the SDPA/Western Planner Conference in Spearfish, South Dakota! Details are at the end of the article. Photo provided by Community Planning Assistance for Wildfire. This year, over six million acres have burned across the country, impacting communities and forcing evacuations. While firefighters are doing a fantastic job, they cannot be 100 percent effective at fire suppression. Utilizing land use planning to prepare our communities for the dangers of wildfire can drastically mitigate the impact of wildfires to local infrastructure, watersheds, housing and economies. The United States has seen an increase in large wildfires in the last decade with a concentration of these in the West. The National Interagency Fire Center reports the number of acres burned has more than doubled, from 4.5 million acres in 1960, to 10.2 million acres in 2015. At the same time, development in areas that are most at-risk to wildfires, known as the wildland urban interface (WUI), has seen dramatic growth. According to the International Code Council an estimated 60 percent of all new homes in the United States are built in the WUI, further putting lives and property at risk. With the increase in WUI development across the country, WUI fires are becoming common place, directly correlating to increased suppression costs, loss of life and property. Ninety seven percent of wildfires in the U.S are successfully contained due to the immense effort and growing cost of fire suppression and land management agencies. The 3 percent of fires that cannot be controlled, are the incidents that can impact the built environment. Preparing communities through integrating planning and mitigation techniques can drastically reduce the impact of these incidents and allow for more effective suppression response. While there are many successful national programs that focus on reducing risk to wildfire prone communities, none specifically address in-depth land use planning. The Community Planning Assistance for Wildfire (CPAW) program supports communities’ efforts to reduce wildfire risk through improved land use planning at the municipal and county levels. CPAW works directly with planners, fire personnel, foresters, and other stakeholders in a community to integrate wildfire mitigation into the development planning process. Land use planners, foresters, and researchers on the CPAW team provide recommendations, risk assessments, and research to communities, as well as facilitate peer-to-peer learning exchanges and capacity building. Examples of CPAW community recommendations and actions are located on the CPAW website. CPAW is funded by the U.S. Forest Service and private foundations. Services come at no cost to the community and implementation of all recommendations are under local authority. Since 2015, CPAW has worked in 14 communities across the Western and Mid-Western U.S. When a large smoke column rose from the Scratch Gravel Hills in the northern part of the Helena Valley in June of 2012, it could be seen from the Montana State Capitol in downtown Helena. When the fire was contained days later, 200 firefighters had responded, four homes had been lost and another 30 damaged. More than 300 people were evacuated from nearby neighborhoods. The aftermath of the Scratch Gravel Hills (“Corral”) fire heightened awareness of wildfire risk in the Helena Valley. With a rapidly growing population, lengthening fire seasons, and limited water supply for suppression, Lewis and Clark County became determined to incorporate wildfire more intentionally into its land use planning activities. The County joined CPAW in the fall of 2016 following the recent update of its Helena Valley Area Plan, which recommends adoption of a zoning overlay for the wildland-urban interface (WUI). The CPAW team will explore implementation strategies for this and other WUI planning opportunities. Consistently named one of the best places to live in the U.S., Bend, Oregon is one of the fastest growing municipalities in the nation. With an active fire history throughout the region and recent fires destroying homes and other structures, the challenges associated with the rapid pace of development make planning for wildfire a priority. 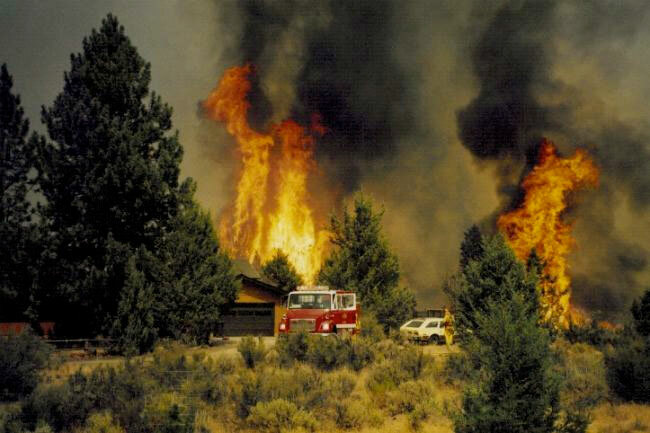 After the Skeleton Fire in 1996, which burned 18,000 acres and destroyed 30 structures, several regional and county initiatives were developed to help educate landowners and improve wildfire preparedness, including Project Wildfire and FireFree. Develop and adopt future WUI policies and regulations that address newly annexed land as approved by the Urban Growth Boundary expansion plan. Now in year two of the CPAW program, Bend is working to prioritize and implement the recommendations. The CPAW team continues to provide support and guidance including research, public presentations, training and networking for Bend partners. Visit the website for more information. The eastern slope of the Cascade Mountain Range in Washington has recently experienced several large wildfires affecting local communities. In 2015, the Chelan Complex fires destroyed homes and businesses within the City of Chelan’s urban growth boundary, severely disrupting local services and the economy. In addition to the Chelan Complex Fire, the region has a long history of wildfire and will continue to be prone to wildfire events in the future. In the fall of 2015, the City of Chelan became a CPAW community. Throughout 2016, the CPAW team worked with local stakeholders to understand the wildland-urban interface (WUI) conditions in Chelan and provide recommendations to improve planning documents. Recommendations included developing broad community partnerships to support wildfire initiatives, such as creating a wildfire steering committee and developing a Community Wildfire Protection Plan. The CPAW team also recommended the adoption of land use regulations to address wildfire, such as a wildland-urban interface code, flammable materials ordinance in an industrial corridor, and landscape standards. Today, the CPAW team is providing ongoing support to the City of Chelan as it implements recommendations. In addition, the County of Chelan saw the benefits the City received through CPAW and successfully applied to join the program. The County became a CPAW community in 2017. Visit the website for more information. We will be offering a pre-conference session presented by Community Planning Assistance for Wildfire for $50. Read the flyer. Ben Yellin,MCP is an Associate Planner at Wildfire Planning International, and provides customized research and planning assistance to communities in the wildland-urban interface. Before joining the WPI team, Ben operated as a wildland firefighter for seven years on Hotshot, Helitack, and engine crews for the US Forest Service and National Park Service. Ben earned a Bachelor of Natural Resource Tourism degree from Colorado State University and a Master of Urban and Regional Planning degree at the University of Colorado, Denver. While completing his Master’s, Ben participated in natural hazards and wildfire mitigation projects across the U.S and landslide field research in northern India. Ben provides planning and forestry support to the CPAW team.